As you know, I have a thing about decorating. I love looking at decorating books, websites and magazines. Last week I checked some books out of the library hoping to find some inspirations for our home (it pays to plan in advance) so I thought I’d share some photos from one book which really struck me as things to keep in mind. Of course the book was jam packed full of great photos, textures, colours, spaces and wonderful ideas. I couldn’t include them all, but here is a taste. 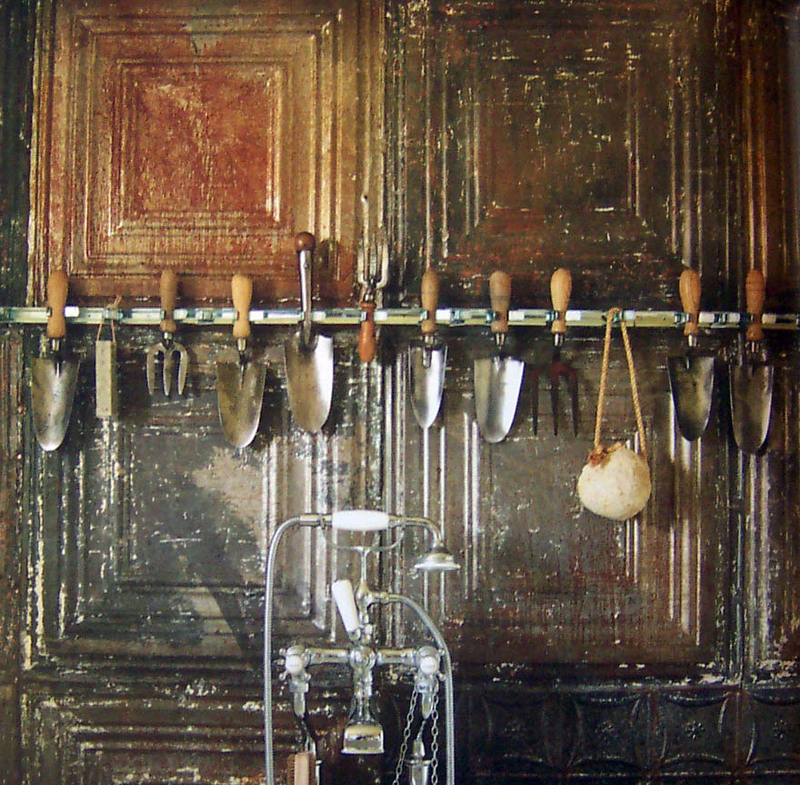 This bathroom wall made from vintage ceiling tiles holds a collection of vintage garden tools. 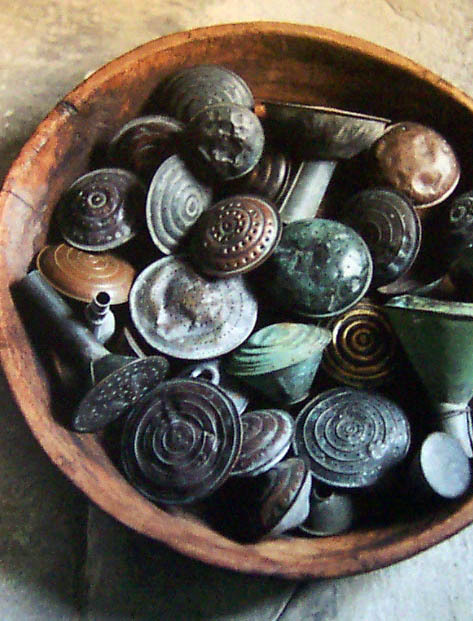 I just love collections of things. I have a few collections and I’m always expanding the number of collections and the collections themselves. So far, of course, the hands-down winner is the poodle collection. I don’t think any of the others stands a chance against the poodles. A wobbly handcrafted bowl holds a wonderful collection of old coppy and brass watering can roses. Now I feel the need to find and collect watering can roses! 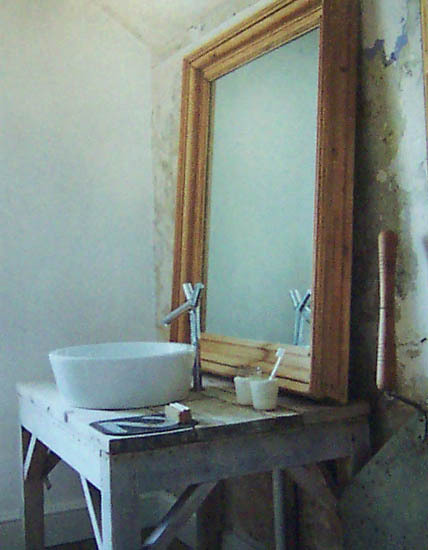 A weathered old table, a new sink & mixer tap, an old framed mirror stripped to bare wood create a rustic feel in this bathroom. Gotta love that combination of new and old. Ditto here, new sink and tap on an old cupboard for the kitchen. 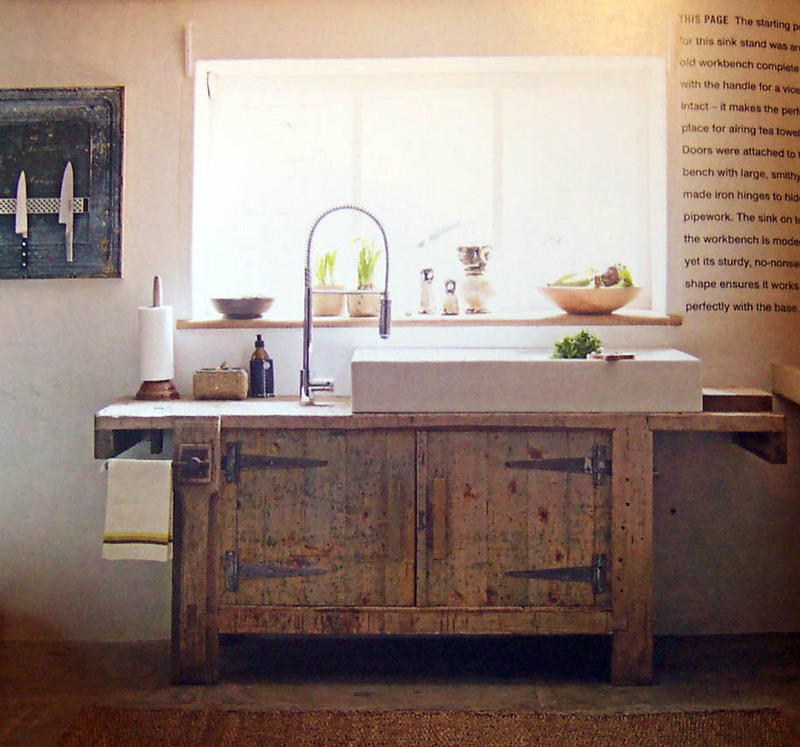 I probably won’t do this in my kitchen, but I do want a butler’s sink, a long gooseneck tap and chunky timber benchtops with white timber cupboards. I don’t want a modern, all built-in kitchen, but I don’t have that kind of space to play with. 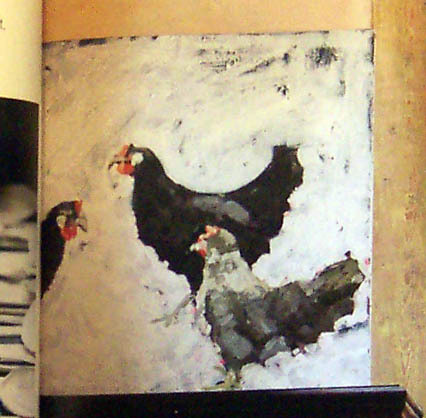 I just love this free, expressionistic painting of chickens. I am inspired…. I want to make one of my own featuring our own chooks. Below, gorgeous simple curtains made from stitching together natural linen towels with pieces of gingham for a bit of colour. And a curtain made from pieces of sheer fabric sewn together in a graphic pattern to form a sheer curtain which allows filtered light into the room. 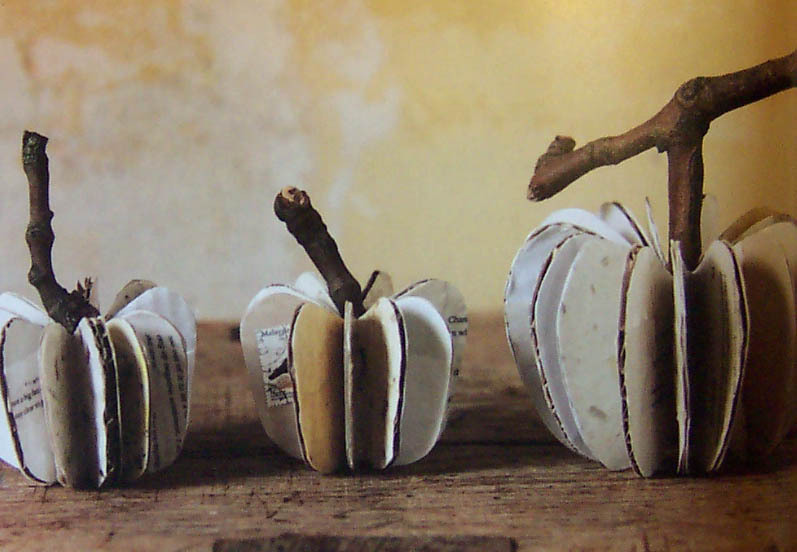 Love these handmade apples made by artist Eiko Yoshida, using twigs, recycled paper, magazines, envelopes (complete with stamps) and corrugated cardboard. Clever and very pretty. If I had the patience I think I could make something like this. Now, that I’ve lulled you into a false sense of security regarding the beauty of this blog contents, here is a reality check. Yep. That was the new, still in its box, magnetic flyscreen I bought to try out on the outside door. 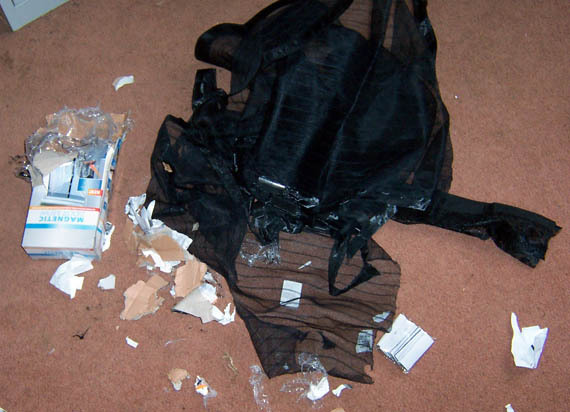 And yep, Barney got bored and ate it. 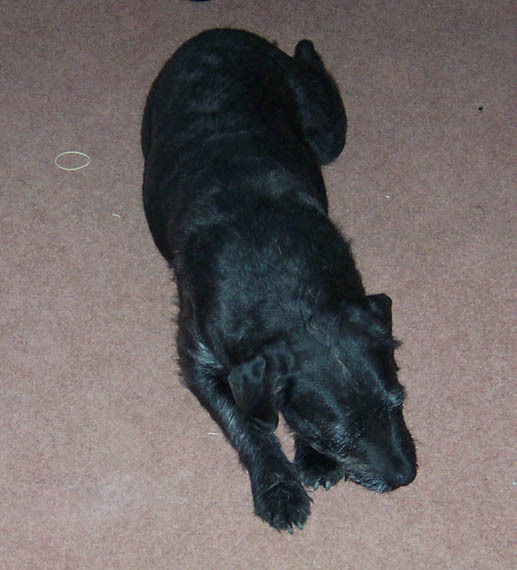 This is Barney – a wiry haired black mut of mixed parentage. This is Mischa. His poor long suffering mother. 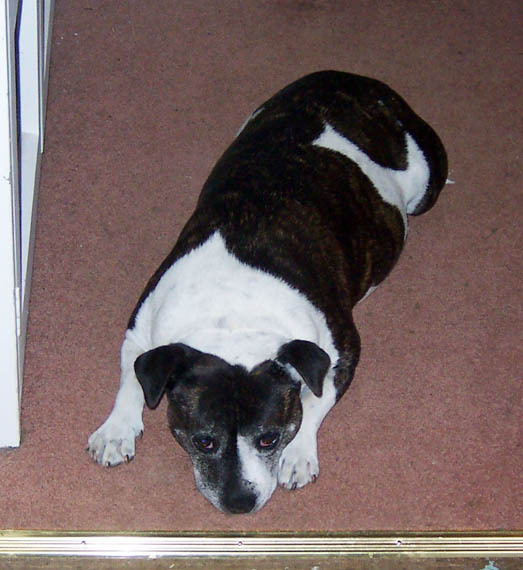 She lies in the office doorway, guarding and being good while Barney finds things to chew. If he doesn’t find some manners soon this house will once more become a Barney Free Zone. 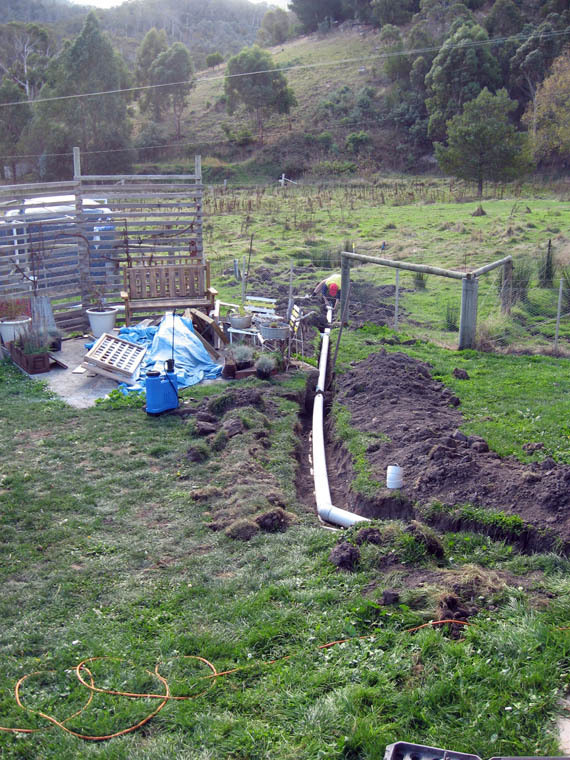 Meanwhile, our plumber is finally here, replacing all those pipes. 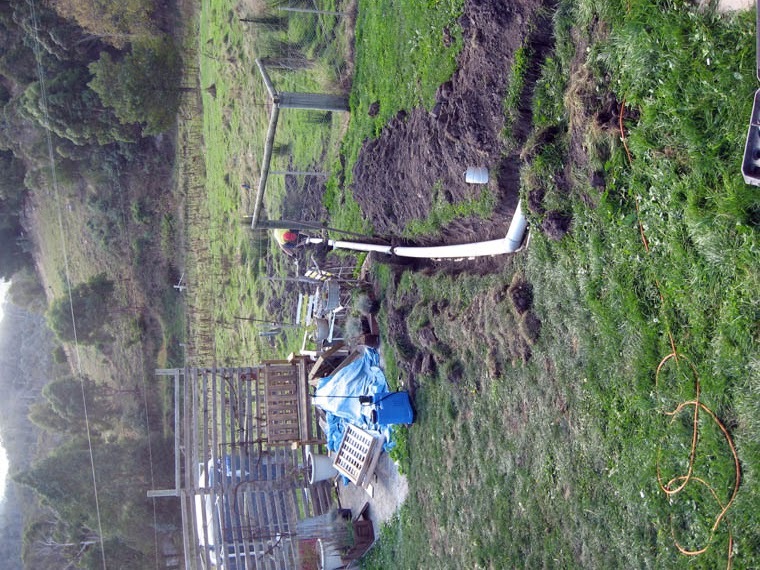 The yard actually looks worse now than when Wayne started digging up pipes over a week ago. Its rained this week, and let me just say, the poodles who were formerly white are now a dusty brown. Hopefully this is it for the big jobs around here. For now at least. We’re both over the big stuff. Oh, I know there is more big stuff to come (don’t tell Wayne, but I have plans…) however it’d be nice to have water that runs out of the shower when it should, doors that close as they should, etc. Then I can concentrate on the smaller projects I can take care of myself! This entry was posted in Uncategorized by zefiart. Bookmark the permalink.